Big red button means it’s SERIOUS! Drawing comics is great, but after a year of drawing, I really miss writing novels. It looks like 2015 will see more of that, and maybe short stories, and hopefully more literary submissions, but as long as I maintain my stride, that shouldn’t stop me from drawing 3 comics a week. For now, I want to get a couple weeks up on the strip, so that I’m not putting finishing touches on something at quarter of 1 in the morning, 45 minutes after I wanted it published. I’ll be taking another vacation from the comic between Christmas and New Years’ Day, but unlike the break I took Thanksgiving weekend, I hope that I will be conscious and healthy and able to draw and write the entire time. The Fox asked if I was accepting Dragon Comics fanart, which, of course, I am. So look forward to a guest comic from a mind equally twisted as mine, but twisted in a different way. 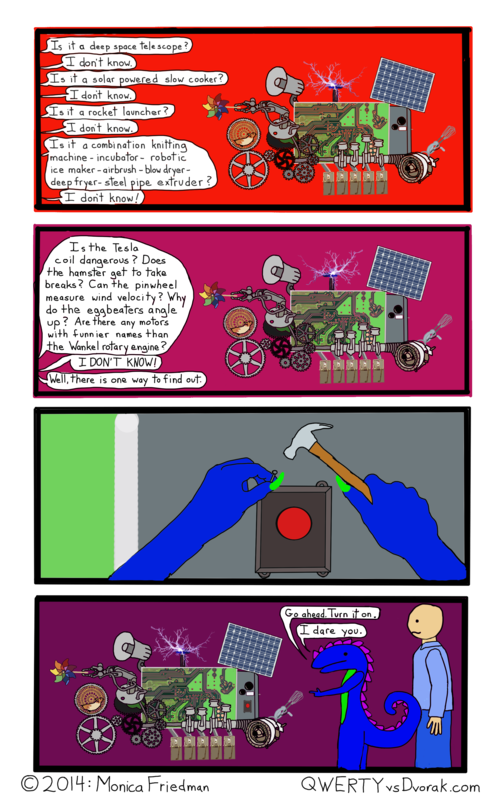 This entry was posted in Comics, Dragons and tagged button, comic, dragon, machine, mystery, turn it on, webcomic on December 8, 2014 by littledragonblue.